"Delicious and easy spicy Thai steamed mussels that can be finished in just thirty minutes." In a large stock pot, combine the lime juice, coconut milk, wine, curry paste, garlic, fish sauce and sugar. Stir to dissolve sugar and curry paste and bring to a boil over high heat. Boil for 2 minutes then add mussels. Cover and cook, stirring occasionally, until mussels are opened, 5 to 8 minutes. Remove from the heat and discard any unopened mussels. 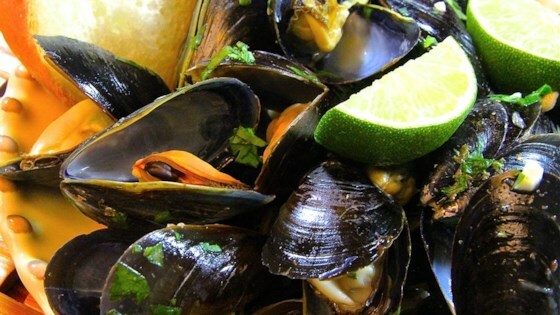 Pour mussels and liquid into a serving dish and toss with cilantro. These delicious, Thai-inspired steamed mussels are ready in no time. We made a big pot of these for a party we had on Monday (since it was a bank holiday here)Great idea - served them with some pickled ginger and hot chilli sauce. Nice and spicy!